If you are on a budget then I can recommend this hotel. The rooms while basic are very clean and comfortable, and the staff are brilliant. The food on All Inclusive is very well cooked and there is adequate choice to suit most tastes, the salad bar being especially yummy. Felix keeps the guests entertained in the evening and is brilliant with the younger children. The hotel is located just a short stroll from the beach and all of the bars and restaurants, but far enough away that you are not bothered by noise. Myself and my daughter went on our first official holiday here. It was very clean within the apartment and the whole hotel. The food was nice and the beverage choices are good. The staff are lovely and really made our stay a pleasant one. We meet some wonderful people during our stay. Not far from the beach and the little stores had everything you could think off if you wish to bring presents home. Missing it already! Recommend it & would go back! I stayed in this hotel for 1 week 5th september to 12th september. solo traveller, was given a room in the quieter part of the holiday centre which has its pros and cons. Good because you don't get disturbed by anyone but bad given that you had to walk down behind the car park and through a garden path which is a little eery late at night! Aside from that the apartment was fine, lots of pots pans cutlery etc, toaster and even microwave. Towels were changed 3 times in 6 nights i stayed there but the bed linen was not changed once. Cannot really comment on hotel staff as I didn't have much contact with them. Didn't go to the BBQ they had. Only stayed by the pool for an hour on morning of departure. didn't eat in the bar area. Overall, its not a bad place to stay, just a 3 minute walk into the town & 4 minutes to the beach, brilliant! The hotel room was basic and not much to look at inside the apartment, however it was impeccably clean and we received fresh towels every other day. the room had a fridge and hob so we were able to cook some food if we wanted. however because of it's location you walk out of the hotel and there are a number of restaurants, cafes etc. which you can get something to eat. Along this strip is also a number of pubs therefore being in an excellent location. within the hotel there was not very much to do during the day or night but this may be due to it being a quiet week outside season. I would recommend this place again to both couples and families. I stayed in the holiday center from 7th July to 21st July have stayed here numouries times excellent staff all round very friendly in particular the girl that did the 4.00pm to 10.00pm shift on reception. Enjoyed bingo nights even though we did not win anything this year my daughter really likes apartments and Santa Ponsa. This was a cheap gettaway for us and it was ideal. The room was basic but live-able. It was early season so not many people therefore not much call for entertainment, towels and room cleaned every other day which was fine for us as we kept it clean anyway. Staff excellent with easy going manner and happy to help. The burgers from the pool bar are really tasty best Ive ever tasted and the local restaurant called Mrs Murphy's kitchen is the best for quality and price. We would visit again no probs but if you want a posh holiday with all the frills then it's not for you. I thought these apartments more than adequate for our needs. I was with three friends aged mid twenties to early thirties, and we had a fantastic easter break in Mallorca. We arrived on Thursday morning, and left Monday evening. We never intended on spending much time in our room except to sleep, so we were not deterred by negative reviews (and there are a few for these aprtments). For one thing, as it is self catering the cleanliness depends on how much effort you are willing to put in to keep your own apartment tidy - I had no problem with the communal areas (e.g. reception/around by the pool). We got our towels refreshed and rubbish picked up on Saturday morning, which was perfect for us time-wise. If I have a criticism it is a small one - I know it is self catering but some dishwashing liquid would definitely not go astray. They provide the dishes but not the tools to clean them (we bought some of our own, so no big deal). I cannot comment with much knowledge on the staff but they were helpful and courteous when we needed help, which wasn't very often. I cannot comment on the entertainment either, as we provided our own rather than taking part in what the hotel offered. 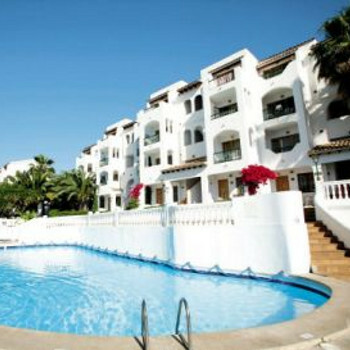 For a cheap apartment, Holiday Centre certainly exceeded our expectations (which, being young, easy-going Kiwis were admittedly not high) and I would feel very happy recommending it to visitors of Santa Ponsa. The hotel cleanliness was not to bad but only got 4 clean towels every four days for two weeks which wasn't good enough as there were four of us staying in the apartment. The location was very good because we were beside all the nightlife. I didn't like the hotel staff. We arrived at the hotel in the afternoon and checked in. We then had difficulty finding the room as the room was very secluded. The rooms were very basic and in the time that we stayed there our bedsheets were changed once in two weeks. Although the hotel was well located the overall cleanliness was disgraceful.